London is an amazing city filled with rich history, endless art galleries and gorgeous parks and rivers. Another dazzling attraction, so to speak, is the B2B Marketing Ignite 2017 conference. As the most influential event of its kind in the world, this gathering focuses on B2B marketers, their goals and challenges and provides actionable tips and advice to better connect with their audience. This year, TopRank Marketing CEO, Lee Odden will light up the conference with his opening keynote on the topic of influencer marketing, and what it actually means for B2B brands. This presentation will take real-life examples of how enterprise level B2B marketers are incorporating influencers of all types to better attract, engage and convert buyers with high-quality content, and how you can integrate influencers into your marketing mix. Below, you’ll find some more details about Lee’s presentation and what you can expect to learn. Title: Opening Keynote: Mighty Hype or Great Hope for B2B? Description: Hot marketing topics come and go with “influencer marketing” riding high into 2017. But what does influencer marketing actually mean for B2B companies? What are the major trends B2B marketers should follow to integrate influence into their marketing mix more strategically? Think of the last time you made a decision to buy a business product or service. What were the major influences on that decision? B2B buyers do research, create specifications and might even form a committee. Without realizing it, most are influenced by peers, industry experts and others who they trust. But how can B2B brands make an intentional effort to collaborate with the right influencers in a way that is genuine and believable? In this presentation you will learn how enterprise level B2B marketers like Dell, SAP and Oracle are incorporating broad and niche influencers to scale quality content that attracts, engages and converts more buyers. Want to Join Lee at B2B Marketing Ignite 2017? We’d love to connect! Register here for the event. 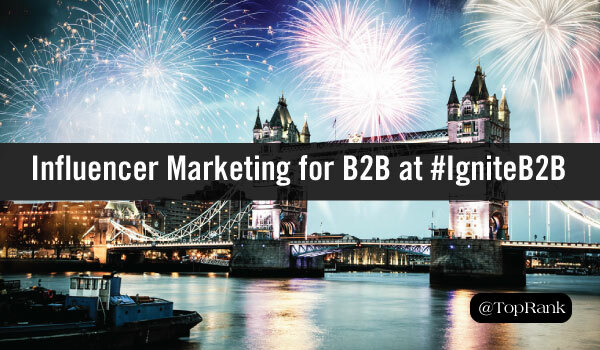 You can follow the hashtag #IgniteB2B on Twitter for updates, and @leeodden for live tweets from the event.